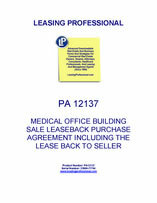 This form is a real estate purchase agreement for an acquisition of a medical office building. A portion of the purchase price is paid in cash at the closing, with the balance paid by the buyer over time pursuant to a promissory note. The purchase agreement contains customary representations from both the seller and the buyer, as well as mutual indemnifications. The purchaser has a period of twenty days in which to conduct due diligence on the property, and the seller must deliver engineering reports, title information, underlying leases and related documentation to the buyer within ten days from the signing of the purchase agreement. The property will be leased back to the seller following the closing, and this lease is included as an exhibit with this product. Also included is a form of guaranty for the corporate parent of the seller tenant, and the promissory note for the seller carry back of part of the purchase price. THIS REAL PROPERTY PURCHASE AND SALE AGREEMENT (“Agreement”) is entered into between Professional Care Associates, L.L.C., a __________ limited liability company (“Purchaser”) and Professional Care Medical Center, Inc., a __________ corporation (“Seller”). The Effective Date (“Effective Date”) of this Purchase and Sale Agreement will be the date of the later execution by either party. together with all and singular the rights and appurtenances appertaining to the land, including any right, title and interest of Seller in and to adjacent streets, improvements, and fixtures attached to the land, all of the adjacent vacant land, all rights and appurtenances being hereinafter referred to as the “Property”; but subject to the easements and restrictions of record and standard title insurance policy exceptions. Without limiting the foregoing, “Property” shall include that certain building located at _________________, __________ commonly known as the Professional Care Medical Center building (“Building”), and the adjacent land, both further described in the Assessors description attached to Exhibit A. It is agreed and understood that any personal property of Seller on the Property and any trade fixtures, including without limitation, is not included in or subject to this Agreement. (a) Promissory Note. As part of the payment of the Purchase Price, Purchaser will execute and deliver to Seller at Closing a promissory note (“Promissory Note”) in the amount of ______________ Dollars ($_________). The Promissory Note is attached hereto and incorporated herein as Exhibit B. (b) Payment at Closing. The balance of the Purchase Price as adjusted for the Promissory Note, will be paid at Closing in the amount of ______________ Dollars ($___________) in accordance with Section 11 of this Agreement. Section 3. Final Legal Description. In the event the preliminary legal description of the Property is different from that contained in the Survey prepared in accordance with Section 5 of this Agreement, the final legal description of the Property (the “Final Legal Description”) will be the one specified on said Survey, and once approved by Purchaser and Seller, the Final Legal Description shall be substituted for the preliminary legal description of the Property contained in Exhibit “A” and this Agreement shall be deemed amended by such substitution without the necessity of the parties executing any further amendment to this Agreement. Upon such substitution, the real estate portion of the Property shall be thereafter defined as set forth in the Final Legal Description. (a) Commitment. Within twenty (20) days subsequent to the Effective Date, Seller, at Seller’s cost and expense, will provide Purchaser with a commitment (“Commitment”) for an ALTA owner’s policy issued by Generic Title Company (the “Title Company”), covering the Property in the amount of the Purchase Price, insuring good and marketable title to the Property. The title insurance commitment will set forth the current ownership of the property, all exceptions, reservations, easements and encumbrances, and all requirements which must be completed prior to issuance of the title insurance policy and will have attached thereto a legible copy of all documents referred to in the Commitment. At the Closing of this transaction, Seller shall furnish to Purchaser a copy of the Commitment, fully marked and initialed by the Title Company, which marked Commitment shall reflect only (i) those items not objected to by Purchaser and (ii) those items objected to by Purchaser for which remedy has been waived by Purchaser as the items to be listed as exceptions in the title insurance policy upon issuance thereof. The Commitment may permit deletion of the Survey exceptions at Purchaser’s cost and expense. Upon termination neither party will have further obligation to the other party hereunder. (c) Issuance of Policy. At Closing, or as soon thereafter as is practical, Seller will cause to be issued to Purchaser by the Title Company an owner’s title insurance policy in accordance with the fully marked and initialed Commitment referred to above and reflecting all required curative action. All title insurance premiums, charges and costs will be paid by Seller. Section 6. Inspection and Condition of Property. (a) Inspection Period. Purchaser, at Purchaser’s sole cost and expense, will have a period of twenty (20) days (the “Inspection Period”) commencing on the Effective Date within which to conduct such examinations, verifications and studies, including without limitation, zoning and other land use regulations, environmental and engineering, as Purchaser, in its sole discretion, deems necessary; provided however, and notwithstanding the foregoing, Purchaser will not perform any invasive or destructive testing without the prior written consent of Seller, which shall not be unreasonably withheld. 4. Notices received from any governmental or quasi-governmental authority or utility company relating to violations of any laws, regulations or ordinance affecting the Property which have not been corrected as of the date of this Agreement. (c) Limited License. Purchaser, upon prior reasonable notice to Seller, is hereby granted a “Limited License” to enter upon the Property for the purposes of making soil tests and borings, conducting engineering tests, and for the general purposes of inspecting the Property pursuant to the development of a site plan and a determination of the suitability of the Property for the Purchaser’s intended use, provided however, and notwithstanding the foregoing, Purchaser will not perform any invasive or destructive testing without the prior written consent of Seller, which shall not be unreasonably withheld. Purchaser will indemnify and hold Seller harmless from any and all costs, expenses, and damages which are caused by the Purchaser’s conducting such tests and/or inspections on the Property, provided such costs, expenses and damages do not arise from the negligent or willful acts or omissions of Seller or Seller’s employees, agents or contractors. Purchaser will hold Seller harmless and indemnify Seller in the event that any lien or encumbrance attaches to the Property as a result of Purchaser’s activities under this Section 6 and which are not timely satisfied by Purchaser. Upon completion of any inspection, Purchaser will forthwith restore the Property substantially to the condition existing prior to Purchaser’s initial entry upon the Property. This Lease (“Lease”) is made and entered into this ____ day of ______, 20__, between Professional Care Associates, LLC, a __________ limited liability company (hereafter called “Landlord”) and Professional Care Medical Center, Inc., a __________ Corporation, (hereafter referred to as “Tenant”). This Lease will be executed simultaneously with the Real Property Purchase and Sale Agreement between the parties. 1. Demise, Exhibits and Construction of Tenant Improvements. 1.1 Landlord does hereby demise and lease to Tenant the land legally described and depicted on Exhibit A attached hereto and made a part hereof (the “Land”) and the building (the “Building”). The Land and the Building are collectively herein referred to as the “Demised Premises” or the “Premises”. Landlord hereby leases the Demised Premises to Tenant, and hereby grants to Tenant its guests, invitees and licensees all Landlord’s easements, rights and privileges appurtenant thereto, including the right to use all of the parking areas, driveways, roads, alleys, means of ingress and egress and other portions of the Demised Premises, all in accordance with the terms, conditions and covenants contained in this Lease. 2.1 Term Commencement Date. The Primary Term of this Lease shall begin on the _____ day of _________, _____ (the “Commencement Date”) and shall end at midnight on the last day of the __________ (___ th) Lease Year following the Commencement Date (the “Primary Term”). For purposes of this Lease, a “Lease Year” shall be defined as that twelve (12) month period during the Primary Term, or any Renewal Term, commencing on the Commencement Date or the annual anniversary thereof, as may be applicable; provided, however, that if the Commencement Date is a day other than the first day of a calendar month, then the first Lease Year shall include that period of time from the Commencement Date up to the first day of the next calendar month, and any subsequent Lease Year shall be the twelve (12) month period beginning on the annual anniversary thereof. For purposes of this Lease, a “Lease Month” shall be defined as those successive calendar month periods beginning with the Commencement Date and continuing through the Primary Term or any Renewal Term of this Lease; provided, however, if the Commencement Date is a day other than the first day of a calendar month, then the first Lease Month shall include that period of time from the Commencement Date up to the first day of the next calendar month, and each subsequent Lease Month shall be a calendar month period beginning on the first day of such month. 2.2 Renewal Term. Unless Tenant gives Landlord notice that it does not elect to extend the term of this Lease not later than one hundred eighty (180) days prior to expiration of the Primary Term or the then-current Renewal Term, as applicable, this Lease shall automatically extend for an additional term of ten (10) years on the same terms and conditions as provided herein except that the Base Rent (as hereinafter defined) for any such Renewal Term shall be as shown on Exhibit B hereto. Any reference in this Lease to “Term” shall refer to the Primary Term and any such Renewal Term. 2.3 Commencement Agreement. Within ten (10) days of the Commencement Date, Landlord and Tenant shall enter into a supplemental agreement specifying the actual date for the expiration of the Primary Term in accordance with the form attached hereto as Exhibit D.
3.1 Base Rent. Commencing on the Commencement Date (the “Rent Commencement Date”), Tenant shall pay to Landlord for the use and occupancy of the Demised Premises, minimum monthly base rent in the amounts specified on Exhibit B hereto ”Base Rent”. The Monthly Base Rent shall be paid in advance and shall be due on or before the first day of each calendar month during the Term. In the event the Commencement Date falls on a date other than the first day of a month then the Monthly Base Rent for such first month shall be prorated accordingly. Base Rent and Additional Rent, as defined below, is herein collectively referred to as “Rent”. 3.2 Additional Rent. All taxes, costs, expenses and amounts which Tenant is required to pay pursuant to this Lease (other than Base Rent), together with every fine, penalty, interest and cost which may be added for non-payment or late payment thereof, shall constitute additional rent ("Additional Rent"). If Tenant shall fail to pay any such Additional Rent or any other sum due hereunder when the same shall become due, Landlord shall have all rights, powers and remedies with respect thereto as are provided herein or by law in the case of non-payment of any Base Rent and shall, except as expressly provided herein, have the right to pay the same on behalf of Tenant. Tenant shall pay to Landlord interest, at a rate (the "Default Rate") equal to the lesser of fifteen percent per annum and the maximum rate permitted by law, on all overdue Base Rent from the due date thereof until paid and on all overdue Additional Rent and all other sums due hereunder, from the end of the third Business Day after delivery of written notice of default to Tenant. In addition, if Tenant fails to make any payment of Base Rent, Additional Rent or other sums payable hereunder to Landlord within three Business Days after delivery of written notice to Tenant that any such Base Rent, Additional Rent, or other sum payable hereunder has not been paid on the due date thereof, Tenant shall pay a late charge equal to four percent (4%) of the amount past due. Tenant shall perform all its obligations under this Lease at its sole cost and expense, and shall pay all Base Rent, Additional Rent and any other sum due hereunder when due and payable, without offset, notice or demand.